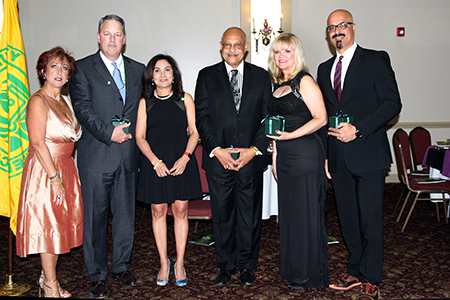 From left, Foundation Chair Lori Danko, Honorees Sean Murray and Savita Lachman of Fulton Bank of New Jersey (Distinguished Corporate Partner Award), Dr. George Pruitt, president emeritus of Thomas Edison State University (Spirit of Education Award), Jeri Bogan Zielinski (Distinguished Benefactor Award) and Rashaad Bajwa, president/CEO of Domain Computer Services (Spirit of Education Award). Student Government leaders joined in the fun and helped to sell raffle tickets. Scholarship recipient Jeremy Muscente, who is studying Business Administration and will graduate in May, spoke of professors who "push students to be great." The silent auction featured 98 items donated by MCCC supporters. The auction raised almost $14,000. The Mardi Gras-themed centerpieces were created by MCCC Horticulture students. 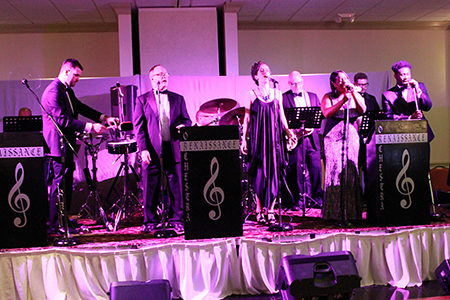 The Renaissance Band performed a mix of new and old hits. West Windsor, N.J. – Donors and friends of Mercer County Community College (MCCC) joined together for Mardi Gras in April as the MCCC Foundation hosted its 29th annual “Spring Into Student Success” (SISS) gala on April 20. 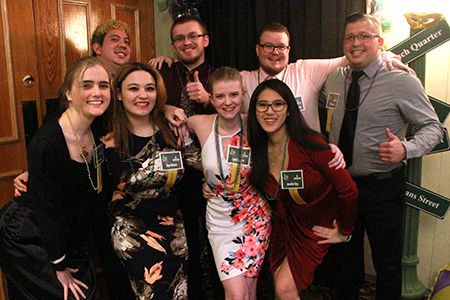 Held at Cedar Gardens Banquet in Hamilton, the festive “Mercer Gras” celebration drew close to 300 supporters, MCCC staff members and student leaders. Proceeds surpassed $100,000, a total only exceeded in recent years by the college’s 50th anniversary gala. “Those funds will go a long way in sustaining and expanding scholarship opportunities for MCCC students. We are extremely grateful that so many have contributed to the success of our students,” MCCC President Jianping Wang said. Overseeing the festivities were SISS Co-chairs Nina D. Melker, past president of the Foundation Board and a current board member, and the Hon. Pasquale Colavita, Jr., and Lori Danko, the chair of the Foundation Board. 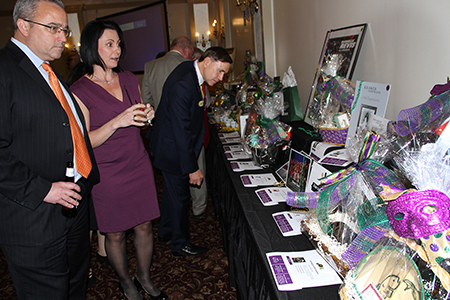 The gala featured an extensive silent auction, for the first time offered online, with 98 high quality items donated by area restaurants, salons, and much more, including tickets for special events. With bidding boosted by lively activity online, the auction raised almost $14,000. 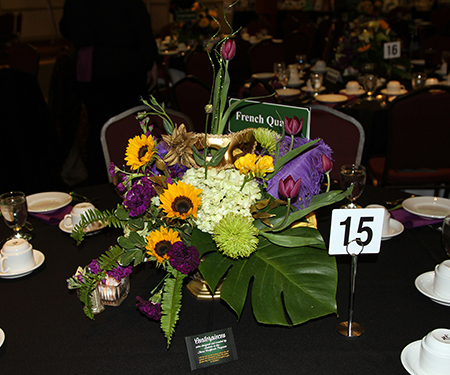 In keeping with the event's theme, the college's Horticulture Program created 30 centerpieces of gold, purple and green. Raffle prizes included a $500 gift certificate from AAA and a pair of gold earring donated by Hamilton Jewelers. Business Administration student Jeremy Muscente was the student speaker. 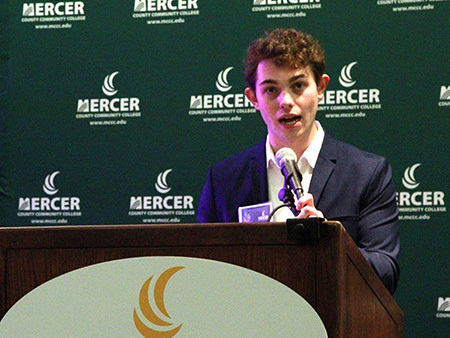 Muscente, the recipient of a generous scholarship from PNC Bank, recalled that he hadn't planned to attend Mercer, but facing unexpected family challenges, he decided he could not go away to school. The Foundation honored four community partners for their dedication to furthering MCCC’s mission. Dr. George Pruitt was the recipient of the Spirit of Education Award. Pruitt, president emeritus of Thomas Edison State University (TESU), served at the helm of TESU for 35 years. During that time, MCCC and TESU became closely aligned through their common commitment to higher education in the city of Trenton. In accepting the award, Pruitt noted, “You don’t do the work because you seek attention. You do it because it’s important. I accept this award on behalf of the hundreds of staff members at the university.” Attending the event with Pruitt was the college’s new president, Dr. Merodie Hancock. Also receiving a Spirit of Education Award was Rashaad Bajwa, the president/CEO of Domain Computer Services (DCS) in Cranbury. Last year, the company partnered with Mercer to open Domain Tech Academy (recently renamed internITservices.com) at the West Windsor Campus, where qualified students can secure paid internships and learn IT skills from Domain’s staff. Several interns have already been hired by the company. Former Foundation Board Chair Jeri Bogan Zielinski was selected for the Distinguished Benefactor Award. A proud member of MCCC’s Class of 1969, Bogan Zielinski retired from Educational Testing Service in 2017 after almost four decades of service. During her tenure on the Foundation Board, Bogan Zielinski led by example as a major donor and volunteer for fundraising events. Bogan Zielinski recalled the difference that scholarship funding made for her when she attended Mercer. “I personally understand the importance of scholarships and why we should support higher education as young people start out on their journey,” she said. The Distinguished Corporate Partner Award went to Fulton Bank of New Jersey. In addition to giving annually to the college’s scholarship events, the bank is represented on the Foundation Board, a position currently held by Fulton Vice President Savita Lachman, who accepted the award with Senior Vice President Sean Murray. The bank offers a tuition reimbursement program and regularly hires MCCC students and graduates. Among the other scholarship student representatives attending the event were mother and daughter Victoria and Rachel Fredrick, both of whom will complete their A.S. degrees in Nursing in December, Trevor Jones, who will earn his A.A. in Liberal Arts/Education in May, and Jennifer Macario, who is also graduating in May with an A.S. degree in Exercise Science. All plan to transfer to continue their education. In addition to Melker and Colavita, community representatives on the Gala Committee were Peter Crowley, Lori Danko, Diane Grillo, Pat Hartpence, Peggy Iucolino, Savita Lachman and Linda Martin. The event enjoyed the support of a long list of sponsors. They included: New Jersey Manufacturers Insurance Group (Grande Masquerade Sponsor); Dow Jones & Company, Inc. and PNC Bank-East Brunswick (The King of the Carnival Sponsors); Fulton Bank of New Jersey, Spiezle Architectural Group, Inc., Wells Fargo and Jeri Bogan Zielinski and Barry Zielinski (The Queen of the Carnival Sponsors); Borden Perlman Salisbury & Kelly, Domain Computer Services, Fairleigh Dickinson University, Princeton Memorial Park Association, Mr. Sam Sim, PSE&G, Rutgers, The State University of New Jersey, TD Bank, Thomas Edison State University, and The Tuchman Foundation, Inc. (Purple Justice Sponsors); Berkshire Bank Foundation, Inc., Capital Health System, First Bank, Investors Bank, Jammin' Crepes, Mercadien Group, PFM Asset Management LLC, Rider University, Robert Wood Johnson University Hospital Hamilton, and Dr. Jianping Wang (Green and Gold Sponsors); Aamir Rehman and Hina Ghory, Advancing Opportunities, The Ammon Foundation, BAC Local #5, New Jersey, Carpenters Local #254, CSS Building Services, Inc., Edward Jones, Phoenix Advisors, LLC, and Plumbers and Pipefitters Local #9 (Celebration Sponsors); Dennis and Susan Walsingham, Dress for Success Mercer County, Dr. Tammy A. Duffy, Ms. Carol L. Golden and Ms. Pamela J. Hersh, Hibbert Group, Tim Moonan, Melissa Tenzer, and the New Jersey Business and Industry Associates (Name Your Scholarship! Sponsors); and Vip Jain, Dr. Apostolou, Rashaad and Michelle Bajwa, J. Lynne Cannon, Wayne and Toni DeAngelo, Michael Decker, Kevin Drennan, Edward and Debbie Gwazda, John D. Hatch, Toni Horowitz, Robert Humes, Kris Laskarzewski, Perry Lattiboudere, Esq., Dr. Walt and Leslie MacDonald, Melinda McAleer, Mary Lou Mycoff, Dr. Lawrence Nespoli, Rose Nini, Dr. James B. Shaw, Rosemarie Sorce, Paula Taylor, Cynthia Vona, Dr. Jianping Wang and Michael Schneider, and Dwaine Williamson (FY18 SISS Royal Court Guests). To view the Gala program book, click here.